Quickly Wipe Up Those Spills! Here are five common mistakes to avoid! When you're in the kitchen cutting up all kinds of fruits, vegetables and meats. Be more conscious when it comes to citrus or acidic related foods as those could damage any marble products. 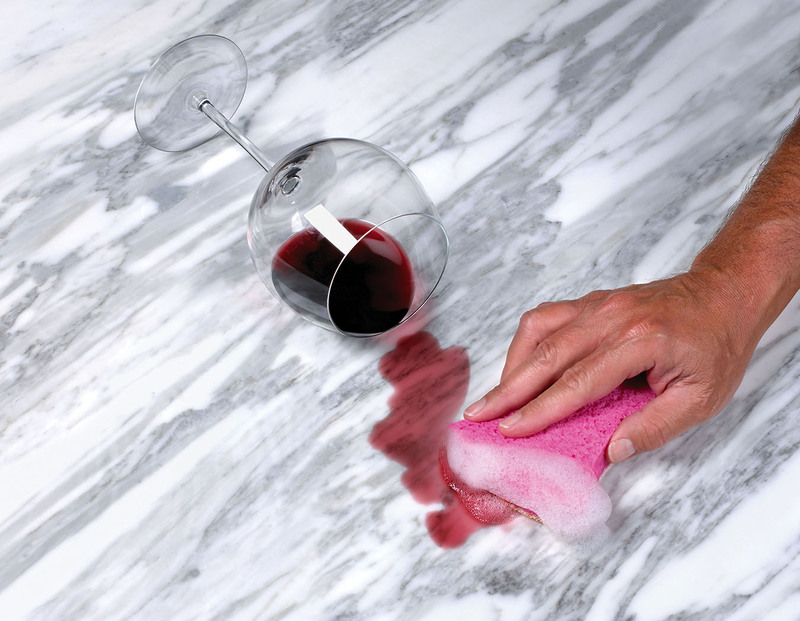 When it comes to cleaners, you need to be sure to use natural stone related chemicals. Many people aren't familiar with the chemistry of cleaners and the chemistry of stone. Cleaners must have a pH level of seven which is neutral. Many natural stones such as marble, travertine or limestone react adversely with vinegar because of the acidic content. It will etch or burn your stone. Many people think they can remove etches or stains with a hard scrubbing pad. In reality, this often times makes it worse because you are basically scraping off the stone surface that was originally polished. All you really need to do is find a soft cloth, warm water, and soap to give it a nice wash. The only way to fix etched stone or stained is to have it restored by a professional. They will need to grind down the surface and repolish again. This one is slightly less minor but occurs more which is dust particles and sand that may rub up against the surface of your stone accessories. Grit will scratch up the surface of the marble and give them an appearance of being dull. A polished surface is a smooth surface, and light will reflect off of it. Don't' think a simple drink spill won't do anything to your marble piece, especially wine, coffee that are quick stains. You want to immediately wipe off and maybe rinse a bit with water. For many marble stones, sealing is part of a recommended general maintenance plan. While it is possible for users to seal their own stone, experts agree that a professional will deliver the best results. If you do seal your stone yourself, make sure you use a solvent-based impregnating sealer. Sealers are a preventative maintenance, but it’s not a be-all, end-all cure. You still need to perform regular cleaning and re-apply sealant when needed. They are usually easily available at local stone shops or even Home Depot if you are U.S. based. Through your proper care and maintenance, natural stone surfaces will stay beautiful for years to come. Because the nature of the material, it really doesn't require that much attention. Every marble piece is unique and those little imperfections and etches in the stone’s surface become part of the stone’s story.